My love of ART and culture is intertwined with my desire to better understand the human experience. Art transmits intimate messages about both the artist and the collector. In this way, the art and artifacts we surround ourselves with become the secret language of our homes. By sharing my ArtPicks with you, I am revealing all sorts of details about myself. This is the main thing to remember when collecting art; it is about expressing your unique soul, not aligning with the hive mind. This summer I scouted the globe to find fresh ART- ART that has something interesting to say about the world we live in. I hope you enjoy my picks. Fiona’s recent paintings, made with batik dye and wax on a very thin canvas, capture the yin/yang of creation. The works pulsate with life pulling the viewer into their energetic vortex. The elegant works have the FEEL of textiles, a feminine realm, while paying homage to abstract painting – traditionally male territory. Fiona impressively mastered the unpredictable technique of batik wax to create large-scale works that embody the balance between control and letting go. I appreciate Fiona’s commitment to both simplicity and craft. Fiona was born in Aberdeen, UK and studied at Glasgow School of Art Lives. She currently lives in Brussels and is represented by Klemms in Berlin. Osamu’s mesmerizing series “Assembly” is rooted in Japanese philosophy and human theatre. Is it the individual or group that should be visible? 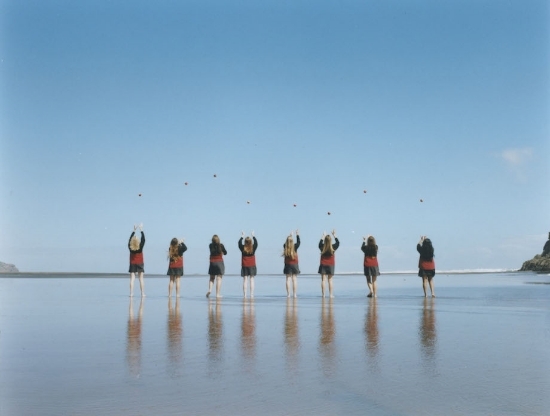 By dressing schoolgirls in uniforms and setting them against the vastness of nature, Osamu dissolves individual identity. The girls become anonymous, yet the collective strengthen and the world becomes a more beautiful place. The images capture moods of adventure, curiosity, lightheartedness and a touch of melancholia reflecting the fluctuating tones of the human experience. Based in Tokyo, Osamu is a widely known for his commercial work while his fine art photography explores his more cerebral musings. Learn more about his visual storytelling here. The warmth and electricity of copper has always held my attention. Recently, I learned that copper is one of the 7 Noble Metals used by the Ancients and ruled by the planet Venus, as am I. I also love books, so you can understand my magnetic attraction to Hilal Sami Hilal's works. His delicate copper sculptures with their page like surfaces visually “read” like books, but fail to fully communicate. Letters float never becoming words, and sentences are nowhere to be seen. Hilal’s childhood was shaped by the death of his father who’s absence left gaps and holes in his psyche. In these fragile works Hilal recalls the tenuousness of language to communicate our deepest sorrows. Brazilian based Hilal’s works can be found in the USA at RH Contemporary. Scouting the globe for extraordinary art brings many delights and a few moments of pure transcendence. I knew at first glance that I had encountered a highly refined soul when I stumbled on Maria’s dreamy works. Her intricate collages made with torn bits of Japanese papers, paints, sequins and other daily materials evoke dreams, myths, and fairy tales. A mediation between the visible and invisible, Maria’s works feel like a love letter to the magical realism character of her motherland, Colombia. I especially love the interplay between historical, supernatural and romantic elements in her heavily patterned works. Her lush compositions populated with sacred female figures, animals and flowers, offer a dazzling respite from hard-edged realism. Now based in Brooklyn, Maria is represented by PRAXIS. Michele offers a stripped down version of dream-like creation with his “surreal minimalist” series entitled Was ist Metaphysik? The Italian designer and architecture professor creates his pristine images with 3d modeling, animation and renderings. Large white spaces and blue waters quiet the mind in his futurist cityscapes. Michele conceived these works to exist at the junction of fiction and fantasy. While devoid of the messiness of human existence, the abstract surrealist images hint at the beauty of reducing everything to its metaphysical core – energy. I appreciate the meditative quality of the works and would not mind waking up to them. Learn more about Michele’s work here. The works featured herefall in the $5,000 - $25,000 price range and are certainly conversation starters. Nothing elevates a room like a bold piece of original art in my view. Reveal yourself with ART. In the meantime, drop me a line and let me know which artist was your favorite and why.